We only sell CE (and FDA) Approved Tests, and the sensitivity will always be marked on each packet you buy, so please make sure that you get what you are paying for. Some sellers claim that their tests are Ultra Sensitive, when often they are no better than the tests you can buy in your local high street or chemist. If you have regular cycles, and have no known problems then we recommend you start with our normal 30mIU sensitivity. We also sell 20mIU sensitivity Ovulation Test Strips, which are more sensitive than 30mIU. Please see our other listing. Ovulation is the release of an egg from the ovary. The egg then passes into the fallopian tube, where it is ready to be fertilised. In order for pregnancy to occur, the egg must be fertilised by sperm within 24 hours after its release. Immediately prior to ovulation, the body produces a large amount of Luteinizing Horomone (LH) that triggers the release of a ripened egg from the ovary. This "LH surge" usually takes place in the middle of the menstrual cycle. The ovulation test detects a LH surge that ulimately predicts ovulation within the next 24-48 period. Knowing that you are ovulating is very important, because there is usually a 24-48 hour window of opportunity to fertilise the ovum. In laboratory trials these tests have proved highly accurate at more than 99.9% in detecting a LH surge in urine samples. These ovulation tests are perfect if you have erratic cycles, or are looking to achieve pregnancy quickly. Pinpoint the right time accurately with these easy to use tests. Use the chart to work out the day you should begin testing. The day you begin testing is listed opposite the number of days in your normal cycle. Please select from the drop down list to select the quantity required. 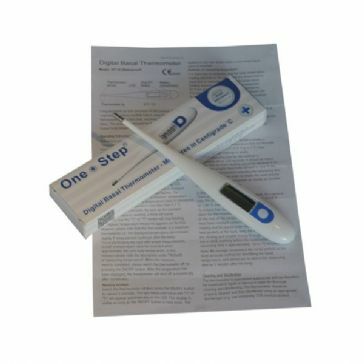 25 x One Step® Ovulation Midstream Tests. CE Approved Ovulation Midstream Test These tests are CE and FDA Approved and test at a sensitivity of 20mIU/mL.